Enerchip. Increased Vitality for Cats and Dogs. before needing to be replaced! 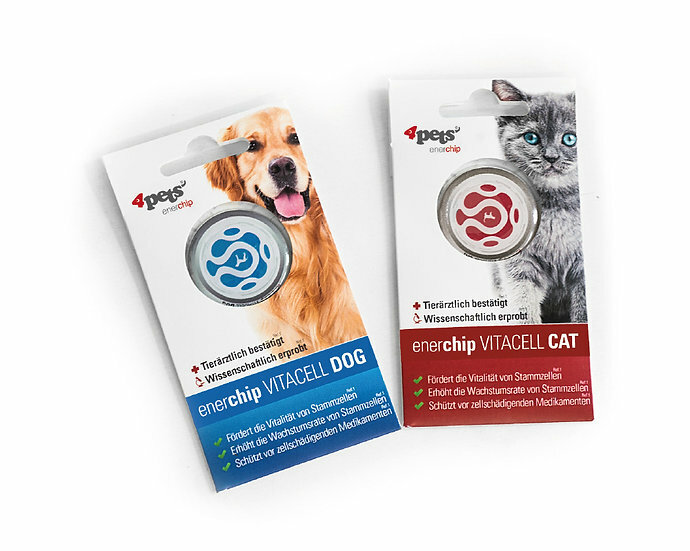 The application of 4pets Enerchip VitaCell is very easy and convenient. Enerchip VitaCell is simply attached to the bottom of the water bowl. dog drinks from the bowl containing the Enerchip VitaCell, the animal takes on the positive influence of the Enerchips via the water. The Enerchip VitaCell chips are based on a mineral-based sandwich construction and are marked by means of biotechnological processes, which transmit the effect via biomagnetic fields (science: spins) in the pico-tesla range (10) to the water. The influence on the animal is thus gentle, side-effect-free and absolutely safe. Stem cells are “neutral” cells and stand out significantly from the mature “work cells” in the body. They are characterized by a high capacity to multiply and have the outstanding ability to form lifelong new tissues by division and maturation. The ability to ripen to different specialized cell types, to divide often, to help the organism to recover and regenerate, makes the stem cells so unique and meaningful for medical therapies. Enerchip helps maintain optimum physical condition of your dog's liver, muscles, nerves, heart, blood vessels, cartilage, bones and skin by supporting the production and vitality of it's stem cells. Safe, gentle and side-effect free. Simply place chip in your pet's water bowl. Effects last 6 months. Enerchip helps maintain optimum physical condition of your cat's liver, muscles, nerves, heart, blood vessels, cartilage, bones and skin by supporting the production and vitality of it's stem cells. Safe, gentle and side-effect free. Simply place chip in your pet's water bowl. Effects last 6 months.